I’m not the sort of parent who panics – well, I’m really not the sort of person who panics. If I see one of my kids fall, I don’t generally drop everything and run to their aid. In fact, I’m always amazed at the rapid response that seems to be preprogrammed into most moms. At the slightest wound, or potential wound, I’ll see all the moms jump to a child’s side – swooping them up and soothing their wails. I, on the other hand, believe that woundedness is a part of life and my sympathy will only make them less capable of handling it. Years ago when I was involved in a sailing accident, that involved us ditching a 40 foot yacht in Alaskan waters, some thought I was joking when I called in our Mayday request. They told me later that I was too calm to be experiencing a life-threatening emergency. I once watched a friend’s daughter get hit in the head with a baseball bat. I reacted like a mom! I ran over and scooped this little girl up and held her in my arms before I even knew what I was doing. It really surprised me – I’d never reacted like that before, or since. Well, until this last Tuesday. It was The Wife’s 10th anniversary of her thirtieth birthday. We took her downtown to REI to get a pair of cool Pacific NW shoes. A couple of hours later and $90 poorer, we were leaving the store. 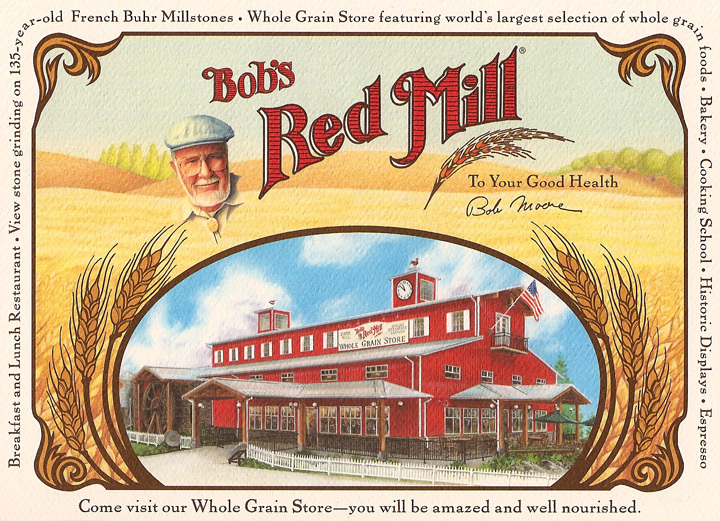 Our plan was to meet a friend at Bob’s Red Mill, in Milwaukie. I was carrying our Smiling Son and Darling Daughter was trailing behind. Daydreaming, is more appropriate. At four years old, she is curious about everything! As she approached the small set of stairs to go out the main exit, she tripped. I saw it coming, but was helpless to do anything about it – she went head first into a steel beam that supports the hand rail. It took her a few seconds to figure out what happened and that she was hurt, but I was already handing our son to The Wife. It didn’t take long for the blood to spot on my hands and shirt, but given how profusely scalp wounds usually bleed, it really wasn’t bad at all. It is really true I keep discovering (over and over), that these things hurt the parents far more than the kids. Of course they’ll never believe us, just like I didn’t believe my parents, but it cut to my core to watch her sail into that steel beam. In fact, all day long I kept rehearsing in my mind the ramifications of accidents, pain, and letting go of my kids as they get older. I’ve been told that from the moment a child is born, we begin the process of letting go. My Mom didn’t do that very well. It is my goal to raise my children in a way that I can let them go with a minimum of fear. By the way, we ended up having a great time at Bob’s Red Mill – and the rest of the day was a huge success! ← If You Don’t Like My Driving, Stay Off the Sidewalks!